The rate of deaths from heart disease, stroke, and cancer in the Mountain Resources Commission (MRC) region are generally higher than those in the state as a whole. The most youthful county by median age – Watauga – is the only county in the region with a rate of deaths from these diseases lower than the statewide rate. As expected, the relationship between older populations and higher rates of death from heart disease, stroke, and cancer is consistent, as all counties with a median age above 45 have a rate of death from these diseases about 50 percent or more higher than the statewide rate. 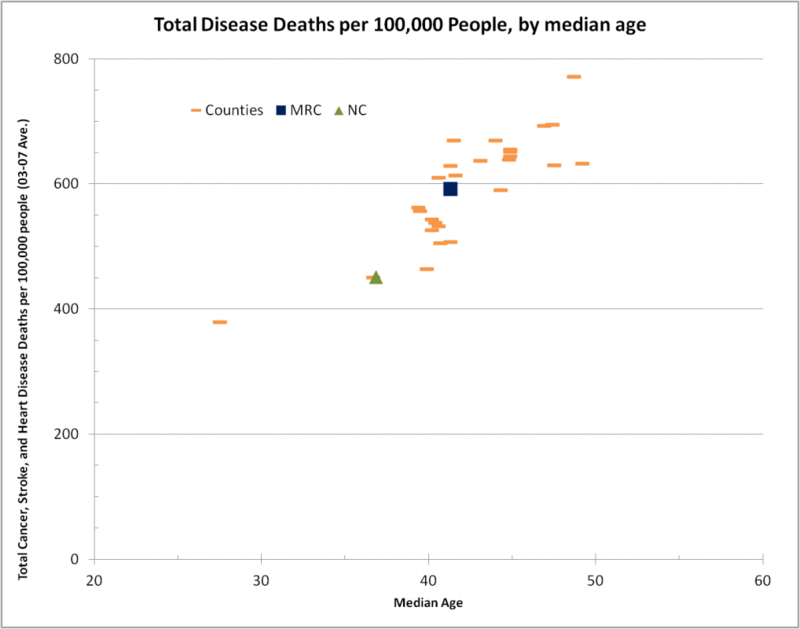 The chart shows each of the 27 counties in the MRC region as orange bars plotted for comparison against median age (x-axis) and total disease deaths per 100,000 people (y-axis). The state average, depicted by a green triangle, shows a significantly lower median age and a lower rate of deaths by disease compared to nearly the whole of the MRC region, with the only exception being student-saturated Watauga County. 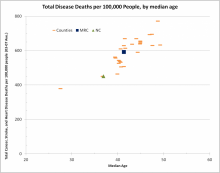 The averages for the MRC region can be seen well above this state average, showing both an older population living in the region and a higher incidence of disease-related deaths. 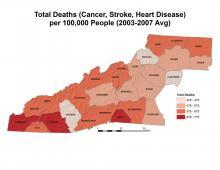 Heart disease is the leading cause of death in the nation, at a rate of nearly one in every four deaths, and it ranks second in the overall causes of death in North Carolina and in the MRC region. Cancer is currently the leading cause of death in both the state and the MRC region, and chronic lower respiratory diseases ranks third. Table source: North Carolina Department of Health and Human Services, Division of Public Health, State Center for Health Statistics. Leading Causes of Death in North Carolina. Accessed from http://www.schs.state.nc.us/schs/data/lcd/lcd.cfm. Diabetes is a growing epidemic affecting 25.8 million people in the U.S. – nearly 8.3 percent of the population – and affecting one in ten individuals in North Carolina. 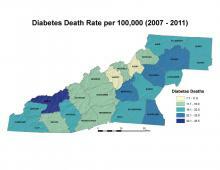 In 1999, approximately 366,000 North Carolina residents were diagnosed with diabetes, and a decade later that number increased by 80 percent to 659,000. In the MRC region, diabetes ranked as the seventh leading cause of death, with approximately 10.4 percent of adults living with the disease in 2009. 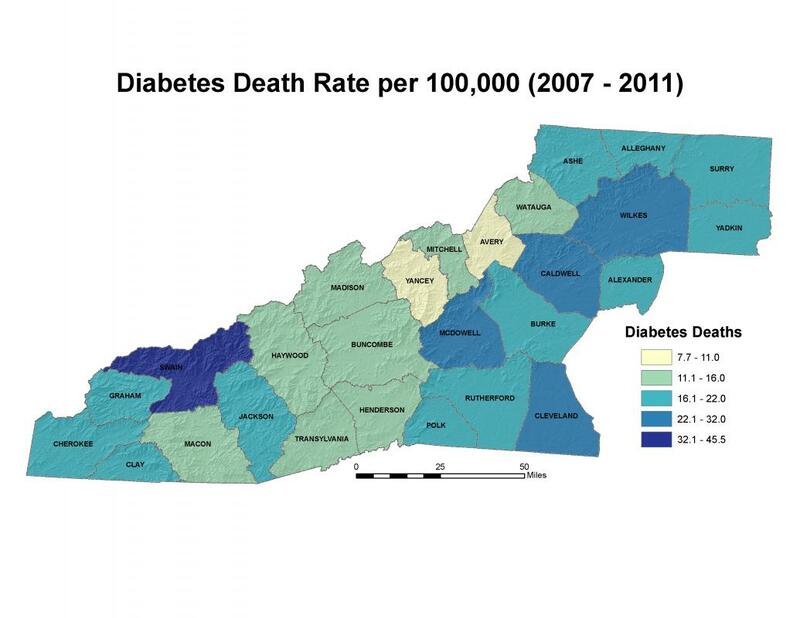 In the MRC region, the highest diabetes death rates were reported in Swain County, at 45.5 deaths per 100,000 individuals, and in McDowell County, at 30.9 per 100,000. The lowest rates in the region were reported at 7.7 in Yancey County and 9.3 in Avery County. 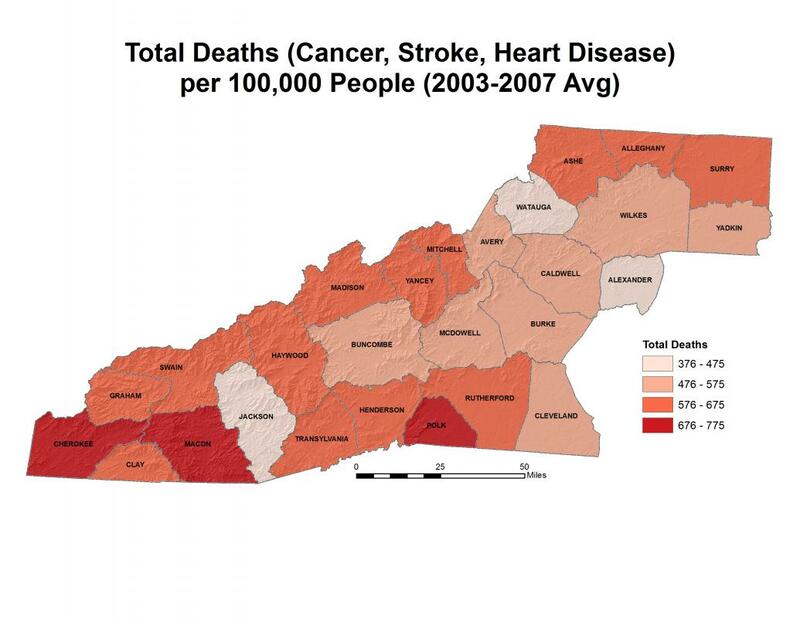 The MRC counties neighboring the state’s Piedmont region follow trends in death and incidence rates similar to counties in much of the eastern part of the state, but the challenges associated with health care accessibility in the MRC region create obstacles for the proper treatment and prevention of diabetes-related illnesses and deaths in those counties west of the Blue Ridge. U.S. Centers for Disease Control and Prevention, National Center for Health Statistics. Underlying Cause of Death 1999-2010 on CDC WONDER Online Database, released 2012. Data are from the Multiple Cause of Death Files, 1999-2010. Accessed from: http://wonder.cdc.gov/ucd-icd10.html.